It's a walkway that tends to grace homes that are done in the modern or contemporary styles. Each paving slab, called a paver, is made of unadorned concrete, either precast or cast in place. The paver is usually rectangular; sometimes square; rarely circular. The great "secret" of this style: you can save tons of money on the pavers because, unlike natural stone walks, style is achieved by placement and context. In other words, if you're going for the square-paver look, 16" concrete pavers (or stepping stones, as they are called sometimes) will suffice. Just take a look at the West Seattle walkway later in this photo gallery and you'll see what I mean. 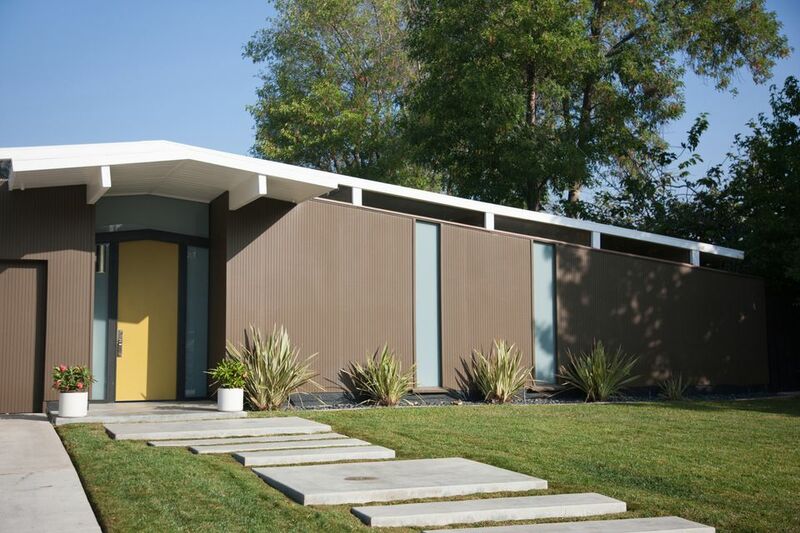 For this pictured mid-century modern home, the pavers continue the look of the house's flat-and-wide architecture. They look like they belong there. Yet they also look different enough that we know that this is a remodeled home. One downside of this "stepping stone" approach is that it makes your lawn-cutting more frustrating. Another concrete paver look that you see often: four giant rectangular concrete slabs are surrounded by gray decorative rock. It's an attractive look and one that works well with the concrete wall, natural wood gate, and xeriscaping. It can be maddening to keep all of that decorative rock free of leaves and other organic material. So, it's best to lay down this kind of walkway in more arid climates. Concrete pavers don't always need to be embedded in grass or resting in rock. Sometimes, the paver levitates above that grass or rock, or above sand, dirt, ground cover, pebbles, or even other concrete. Here, color-tinted precast concrete pavers provide an elevated walkway to the house. A simple, but effective, modern concrete walkway, constructed by pros but one that you can duplicate for your own home: 18-20 square pavers resting in a bed of landscape rock. From Tierra Landscape, LLC, a West Seattle, WA-based company, this design works not just from an aesthetic standpoint, but functionally, too, as the tight spacing means that no one has to leap from paver to paver like a frog. It's even wheelchair-accessible. Also, this is a walkway that you can duplicate with either the smooth-faced or aggregate-faced 16" concrete pavers found at Home Depot. Novel, fascinating walkway in the back of a Denver home straddles two worlds: the verdant, lush, organic world of plush lawn, along with the stark, gray, inorganic world of landscape stone. It's a startlingly brilliant way to pull these two disparate zones together. This idea comes from Mile High Landscaping, LLC, a Denver, CO-based landscaping company. This concrete paver walkway is the most pared-down and simple version of all other walkways shown in this article. It graces the front of a mid-century modern Eichler home. While I cannot determine if this is truly period (probably not, given the excellent state of the concrete--no cracks), this type of walkway is absolutely true to the times. This image comes from Rebecca Gonzalez' excellent blog, Mid-Century Modern Remodel, containing home walk-throughs, retro shop reviews, and remodel updates of her own mid-century modern. Rebecca Gonzalez of Mid-Century Modern Remodel strikes again, but this time it's her own house. Cat Annie relaxes on the drought-resistant landscaping which edges the precast concrete paver walkway. This paver-within-stone look, often accompanied by the succulents, is a classic look. Note, too, how Gonzalez staggers the pavers to avoid a rigid look.